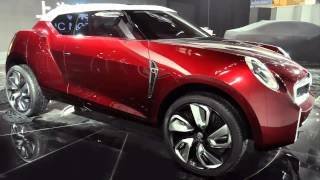 During the 2012 Beijing Motor Show, the Chinese owned MG revealed the MG Icon Concept 2012, an interesting compact SUV concept which may or may not see the light of day in the future. First and foremost, we should point out from the start that the MG Icon 2012 is purely a concept car, but an MG spokesman did mentioned that although currently there are no plans for the MG Icon to be sent into mass production, it shows what we can all expect from future MG models. 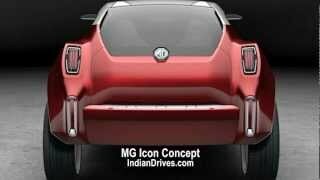 The MG Icon draws inspiration from MG's past and encapsulates design elements from older MG models. 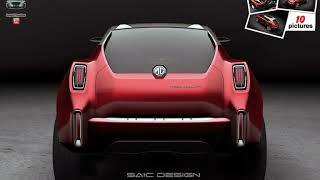 The Icon is only 4 meters long and offers a coupe-like profile. Although not visible at first glance, the MG Icon has four doors, the rear ones being concealed a laMazda RX-8, with the B-pillar missing and a suicide door layout. Although the overall design has a retro feel to it, the rear end is where the MG Icon excels in this regard, with vertical rear lights and exposed tailgate hinges. Furthermore the wheels manage to combine both a modern look and the old wire wheel design found on MG models back in the day. On the interior however, the MG Icon 2012 offers a more up-to date, or rather futuristic style featuring four shell seats and a digital instrument cluster. In terms of engine and performances, as stated before the MG Icon is an early concept and until it goes into full production many aspects are subject to change. However, according to reports the unveiled model had a 1.5 liter four cylinder engine with an estimated output of 109 horsepower, coupled with a 5-speed automatic gearbox. A 5-speed manual gearbox and both a 2-wheel drive and 4-wheel drive version of the MG Icon are said to be made available if the MG Motor MG Icon 2012 hits mass production. Obviously it's too early for MG to reveal the price of the MG Icon, but based on its class and the price of its possible competitors, the Nissan Juke and the recently announced Peugeot Urban Crossover Concept, the MG Icon might have a price tag of somewhere around $20,000 when it will be made available for the masses. As with the price tag, no definitive launch date of the Icon has been revealed, but we're bound to find out more on the matter in the following months.